Alevism in Turkey is not being discussed on theological grounds as a religion, different from Islam, which has its own basics of faith and practice. Rather it is been approached from within a security perspective.. Urheber: Şahan Nuhoğlu. All rights reserved. Alevism is one of the most ancient belief systems of Anatolia and Mesopotamia, being practiced today by populations in Iran, Iraq, Syria, Turkey, Greece, Bulgaria, Albania, Bosnia and Macedonia. After years of migration, Alevi societies now exist in many countries of the world, with the highest numbers being in Europe. The overall Alevi population is thought to be around 50 million. It can aptly be said that the belief system has gone through modifications according to the dominant religion in its respective region, as Alevis have been oppressed by the followers of these hegemonic religions. For instance, the assimilation that Alevis living at the north of Iran were subjected to was under the influence of Shiism which in return resulted in the modification of Alevism into a belief system closer to Shiism, while Alevis residing in Albania, being members of its Bektashi branch had a different course. It is a matter of debate in the scholarly world what Alevism is, where it comes from and how it was created. Some date it back to Ali, a caliph in Islam, while some others believe that it is an Anatolian interpretation of Shamanism, a Central Asian Turkish belief. There are also those who believe it to be the Anatolian branch of Zoroastrianism and others who deem it to be an ancient belief system in the Anatolian geography dating back to the era of the Hittites. As debates around these issues continue, Alevism’s relationship with Islam and the Koran is also a subject of discussion. Alevis defend their freedom to believe and practice and believe that this autonomy is a requirement of Islam, while they also believe that the Islam as it is lived today is a modified version Islam practiced in the Ummayad Caliphate. For a thousand years, Alevis have been subjected to denial, destruction and assimilation policies in Anatolia and Mesopotamia. Alevis are also known to have been regularly subjected to massacres and a systematic assimilation policy beginning in the Seljuk Empire. Consequently, it would not be accurate to see the policies of denial, destruction and assimilation targeting Alevis in AKP Turkey as a short-term politics applied by the Turkish Republic under the rule of the AKP government and the presidency of Erdogan. Such policies targeting Alevis as well as all groups that are not Turkish and Sunni show continuity over time. In order to grasp this situation with respect to Alevis, we need to take a look at the position of Alevis within the dominant Turkish ethnicity and Sunni Islam religion. Alevi citizens of Turkey have either Turkish or Kurdish ethnicity, with the exception of a small Arab Alevi community. In Turkey, Turkish identity is associated with Sunni Islam. A non-Muslim Turkish citizen is not considered to be an acceptable Turk in Turkey. That’s why Christians living around Kırıkkale were exchanged with Muslim Turks in interstate population exchanges during the foundation of the republic. Similarly, Alevis with Turkish ethnic identity have not been considered to be Turkish. Therefore, a factor in the denial of Alevis is the issue with the dominant conception of Islam. We first need to see what type of belief system Alevis have and its difference to Sunni Islam conception in order to get a better understanding of this dynamic. According to Alevis, the Islamic religion and its holy scripture Koran went through modification after the demise of the Prophet Mohammed. The Koran was modified in the times of Omar, Osman and especially Muawiyah and Yezid, with many many verses and pages being burnt and destroyed. That’s why Alevis call the Koran “the stringed Koran” (referring to saz and bağlama, Anatolian musical instruments) and “Kur’an-ı Natık,” meaning the speaking Koran. They consider expressions of bards and sages and the words of duaz imams to be verses of the Koran. Alevis consider cemevis (house of cem) and dervish convents, not mosques, to be their places of worship. Their religious service is not salaah, known as a formal religious practice performed in mosques, but rather a cem performed in cemevis and dervish convents. They fast not in Ramadan, but in the months of Hızır and Muharrem. Alevi is a society in which the human visage is considered equivalent to the Ka’bah, that is, Alevis’ religious practice includes turning their faces to human images. Thus, Alevis reject indispensible rules of the Sunni conception of Islam. Alevis have integrated the bağlama (lute) and the violin in their religious practices as opposed to a conception of Islam which rejects music. In contrast to an Islamic practice that does not accept images and severely prohibits images and sculptures in places of worship, Alevis put images representing their sacred values in all their places of worship, and produce and display sculptures. As opposed to a conception of Islam that does not allow women and men to make religious services together, women and men practice together within the same cemevi in the Alevi society. They also practice semah, which is called “the dance” by some and “the festivity” by some others. Women and men dance together. Alevis who consider Alevism as part of Islam believe that they are the ones who bear and reflect the essence of Islam. They believe that women and men became united in the Cem of the Forties and that it was Mohammed Mustafa who performed the first semah, taking the “dem” (wine) of the first smashed and fermented grapes. Alevis consider Islam as the belief of Mohammed Ali. In this version of Islam, places of worship are cemevis and dervish convents, just as each and every place on Earth. Cem is the mass service. In the Islam of Alevism, there is no separation between men and women; everyone is considered a “can” (life) and services are open to everyone. In the philosophy of En-el Hak, there is no death; what we call death is just walking towards Hak (the God) and reaching it. There is no heaven or hell in Alevism; rather, there is the belief in “rounds” (similar to reincarnation). Above are the belief systems that constitute the Alevi identity. For centuries, they have been subjected to massacres, and have been excluded and oppressed because of this belief system. The above accusations causing the assassination of Pîr Sultan Abdal are indeed basic principles of the Alevi belief system and practices. Diverting from the path of the followers of Sunnah; following the path of Alevism-Bektashism; diverting from the path of four justified sects of Sunnah; cursing Muawiyah and Yezid; not practicing salaah and preventing others from practicing it in Haci Bektash Convent; not reading the Koran and praying in Turkish; representing the God in a human shape, making him resemble a human (En-el Hak); having troubadours in the convent uttering the expression of En-el Hak; not believing in penitence; having good relations with non-Muslims, conversing with non-Muslims in the convent; understanding that that divorce is not in accordance with the Sharia and shall be punished as immoral; not accepting religious practices like the haj, alms, fasting and salaah on grounds that they are just formal practices; believing that the good, but not the bad, comes from God. Taking a look at the death penalties of both Pîr Sultan Abdal and Hamdullah Çelebi, we see that the accusations are the very beliefs and practices constituting the basics of the Alevi belief system. They are penalized for having accepted the principles of this belief system and having rejected the rules of the Sharia, also known as the principles of Sunnah. 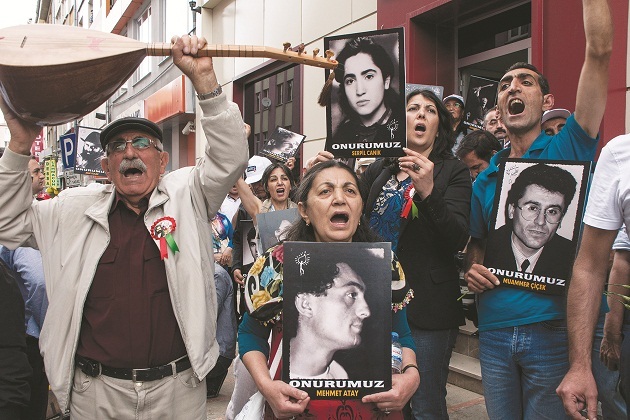 These two cases reveal the reason why the Alevis have been subjected to denial, massacre and assimilation throughout the time. The Seljuks, Ottomans and the Turkish Republic equally rejected the Alevi belief system and attempted to convert them to Sunni Islam. Today’s Alevi policies of the AKP government stem from the politics adopted by the Ottoman emperors in the 16th century. The ongoing policies of building mosques in Alevi places of worship, appointing Sunni religious men to educate Alevi children, imposing Islamic principles that the governors follow and converting Alevis to this dominant version of Islam all began in the 16th century. Alevis living in Europe have established Alevism in many countries as a belief system unto in itself. The fact that Alevis have authentic religious practices, a place of worship and an authentic religious ritual system facilitated the development of Alevism as an exclusive belief system. In Turkish Republic, where the acceptable citizen is Turkish and Sunni Muslim, accepting Alevism as an exclusive belief system apart from Islam is considered to be a security problem. It is the reason why cemevis are not recognized as places of worship; it is considered to be a “red line” for some of the religious men of the state. Alevis who define Alevism as a belief system in itself independent of Islam are considered to be “separatists,” “marginal,” “irreligious,” or even “co-conspirators of Europe aspiring to separate and fragment Turkey.” Although the relation of Alevism with Islam, or the lack of it, is a theological issue, it is regarded as a security problem in Turkey. The problems of the Alevi community in Turkey doubled with the coming of the AKP government. Before the AKP, Alevis were either denied or ignored. Their religious practices were not considered to be authentic; they were forced to be subjected to the principles of Sunni belief system and practice secretly. In addition to all these issues, with the rise of the AKP government, Alevis started to have problems having access to food and employment. They also started to have concerns for their safety. The state forces started to carry out operations against Alevi settlements, finding pretexts to violently suppress their democratic protests. In the period of the AKP, Alevis have been excluded from many decision-making positions in the state bureaucracy. While they are not receiving employment in state institutions as schools, municipalities, and the police force, etc., the Alevis already working in such institutions have been forced to retire, appointed in passive posts or forced to go off duty. These practices in state institutions have also been reflected in the private sector. Although processes have been conducted with the aim of finding solutions for the Alevi people, this promise remained unfulfilled. As a result of innumerous meetings with the Alevi community, two items of information regarding Alevism have been added to the curriculum of the compulsory Sunni Islam classes called “Religious Culture and Morality.” Additionally, the information integrated into the curriculum were on controversial issues in the Alevi community. Moreover, in response to the demands of Alevis to transform the Madımak Hotel5 into an exemplary museum similar to memorials in Europe, the hotel was purchased and nationalized. Instead of transforming Madımak Hotel in accordance with the demands of Alevi community, they turned it into a “cultural center” with a “memorial.” The names of two assassinators who had lost their lives in an attempt to enter the hotel to kill more Alevis were also mentioned in the memorial, alongside with the victims of the massacre. Alevis are still reacting to this act which is recorded in history as a clear indication of the attitude of the government towards Alevis. Cemevis are places of worship for Alevis and their status as such shall be officially recognized. Compulsory “Religious Culture and Morality” classes are Sunni Islam classes aiming at the assimilation of Alevi children. Alevi children shall be exempt from such classes. The Sivas Madımak Hotel, where 33 “cans” (lives) attending the Pîr Sultan Abdal commemoration were massacred, shall be transformed into an “exemplary museum,” including visuals displaying and condemning the massacre. Starting from Hacı Bektaş Convent, all Alevi places of worship and dervish convents, most of which have been seized by the state or are under the occupation of private persons, shall be returned to the Alevi society. All discriminatory acts against Alevis shall be condemned; dissuasive measures shall be taken to prevent such acts. The Presidency of Religious Affairs, which acts as a state institution to serve the hegemony of Sunni belief system in decision-making positions and implements systematic assimilation policies against other belief systems, shall be closed. Assimilation policies targeting Alevis shall be finalized; the policies of building mosques in Alevi villages shall immediately cease. Although above demands of Alevi institutions are the prerequisites of a democratic country; Alevis have been struggling for years for them to be institutionalized. Not having accepted these demands, the AKP government took a path to resolve the problem within its own framework, which is by no means accepted by Alevis and which in itself serves the assimilation policies adopted by the Turkish Republic in general and the AKP in particular. The AKP attempted to lure Alevis into a belief and practice system in line with Sunni Islam. The President Tayyip Erdogan and the Prime Minister Ahmet Davutoglu started to define themselves as “one hundred percent Alevis,” or as “perfect Alevis,” almost insinuating that Alevis shall “practice like them in order to be good Alevis.” This was indeed what such expressions meant. AKP and Sunni Islamist societies started to establish alternative Alevi institutions with a few of their supporters with gathering their own Alevi interlocutors. Alevis have been protesting against such policies through democratic means and methods. They have carried out many mass protests, sit-ins, marches, hunger strikes and pleas against discriminatory acts of the government. Court cases were opened; some of these pleas were lost within the national jurisdiction and some were transferred to the European Court of Human Rights. Cases regarding being exempted from religious courses, the recognition of cemevis as places of worship, demands for equal status to all places of worship and demands for the integration of an Alevi status in the religion column of the identity card were ruled in favor of the Alevi communities in the European Court of Human Rights. However, none of these decisions has been implemented, while the Prime Minister of the time Erdoğan declared them to be incorrect. With the outbreak of the conflict in the neighboring Syrian territory, the Alevi policies of Turkey took a different turn. When the AKP government’s policies of invasion and military intervention in Syria did not win popular support from Turkish public, the AKP started to play up Esad’s Alevi identity. The AKP government, overtly supporting Salafi groups, declared Esad as its enemy and adopted the discourse that “Alevi soldiers massacred civilians in Syria.” While discriminatory acts against Alevis in Turkey increased due to this Syrian policy, Tayyip Erdoğan started to insult Alevis through verbal assaults against the person of Alevi politicians. This language that was adopted by the head of the state was propagated throughout the society. Houses where Alevis resided were marked in different regions of the country so as to intimidate the community. Teachers of religion courses and administrative staff at schools were even bolder in their insults towards Alevi students. Many Alevi workers were dismissed from their jobs. 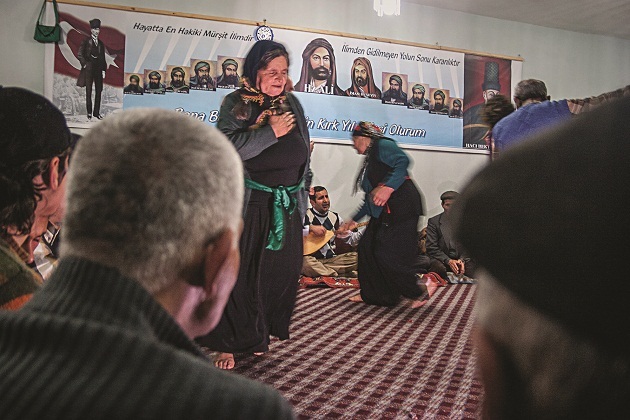 The insistence of the Alevi population in defending its rights by adopting an even more rigorous struggle and seeking new alliances against the AKP caused the latter to revise its policies concerning Alevis. The AKP representing the state’s current mentality was especially challenged by the alliance between the Democratic Party of the Peoples (HDP) and Alevi institutions before the June 2015 elections and the nomination and election of the heads of many Alevi institutions as HDP deputy candidates. The HDP, which met the ten percent election quota in the June elections with the support of Alevis, proved to be the alliance of the oppressed and disrupted the parliamentary majority of AKP. As a result of the above conditions and under the influence of regional factors and recent developments, the AKP started to develop new strategies to gain the sympathy of Alevis and break the growing alliance between Alevis and the Kurdish movement. The government that was established after the elections of November 1 included articles regarding Alevis in its program promising place of worship status to cemevis, granting a regular salary to Alevi religious leaders and a state foundation to partially pay for cemevi expenses. The recent approach of the government, which is primarily an attempt to put an end to the alliance of Alevis with the Kurdish opposition and gain the sympathy of the Alevi society, is far from being able to fulfill the demands of the Alevi society. The Alevi policies of the government do not take into consideration the demands of the Alevi society as the government makes it clear that the cemevis would not be recognized as places of worship. Rather, they would be called “Cultural Centers.” Granting salaries to Alevi religious leaders and promises to partially cover the expenses of cemevis are nothing but initiatives to control Alevi people, just as they do with the Sunni religious leaders. The demands of Alevis go hand in hand with the more general demand for a democratic and secular Turkey. Historically, the problems that are faced by Alevis stem from the fact Turkey has never been a democratic country. These problems can be resolved through neither granting a status to cemevis nor giving salary to religious leaders. The solution of the problem lies in the relations between the state and the religion in Turkish Republic. This problem can only be resolved when the state totally withdraws from the religious affairs. It will thusly be resolved when the overall organization of the religious affairs, including religious education, is handled by civil society. If the problem stems from the fact that Turkish Republic is anti-democratic, the solution can only come from the democratization of this state. 1 İsmail Özmen and Yunus Koçak, Hamdullah Çelebinin Savunması, Belen Ofset, Ankara. 2007. 2 16th century Turkish Alevi dervish, poet and rebel from Sivas. 3 Translation note: Rafizi (the abandoned, the excluded) is an expression used to refer to the Galiya and Batiniyya sects of Shia Islam, as well as Havarics. 4 Ali Haydar Avcı, Osmanlı Gizli Tarihinde Pir Sultan Abdal ve Bütün Deyişleri, Barış Kitap, Ankara. 2000. 5 Thirty-three Alevis were burnt to death on July 2, 1993 in this hotel in Sivas by extremists. 6 These meetings were attended by the author.